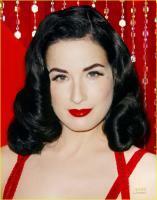 See the gallery for quotes by Dita Von Teese. You can to use those 7 images of quotes as a desktop wallpapers. So I have the green smoothie every day for breakfast, and then sometimes even for lunch too, and then I have a normal dinner. When people say I look intimidating, it's hard for me to relate to. I hear that a lot. I don't know why. I feel empowered the fact that I can look the way that I do on stage and in photos - I can look that way any time I want. And I feel like it's important message to other women that they can do it, too. I have a lot of Burberry items at home, including one dress that I loved so much that I had my living room painted to match because the color was so flattering. I prefer the competitive atmosphere of a classroom setting, like yoga or Pilates. That keeps me going. Although performing on stage is great exercise! I really enjoy watching people like Madonna, or Cher, or Barbra Streisand on the red carpet. I want to see people wearing exciting things that are different and to know that they're not just looking for the latest, most normal thing. I think as someone who collects beautiful things from the past, the thing that I miss the most about modernism and the things I lament about the past are everyday things that you would use were made more beautifully. I'm a designer, producer and I am hands-on for every project I undertake. The creative side of what I do is really something I think people overlooked for a while. Thanks to my mother, people tell me I look younger than I am, especially without make-up. And I suppose my father had a part in making me more frugal with my money. When I started performing, there was no Internet; I didn't really have anything to copy. I kind of had to just make up what I thought burlesque was, based on photographs of Sally Rand or whatever. When I was a little girl, I watched all old movies. My mother liked old movies, and she loved shopping for antiques, so I was around old things all the time. 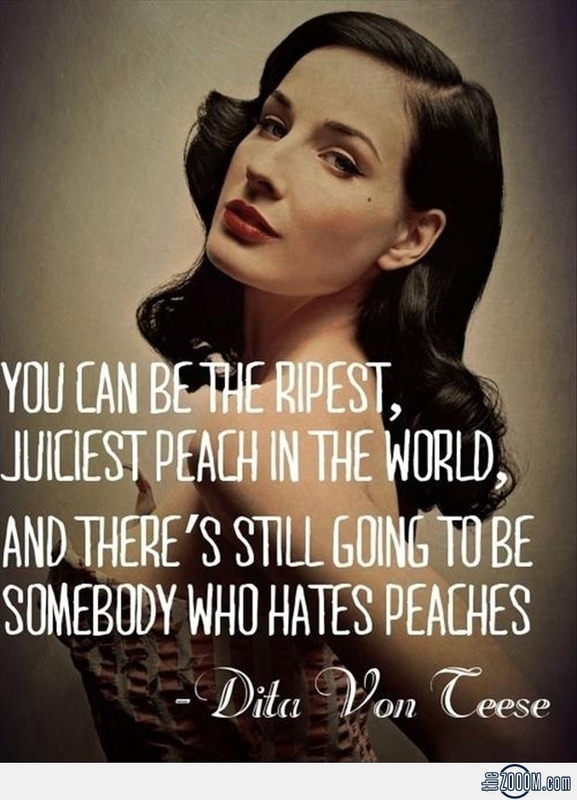 Much more quotes by Dita Von Teese below the page. Physical beauty isn't so impressive to me. But I'm not the girl who changes into flats because my feet are tired at the end of the night. I go the distance. I go all the way. I don't feel I have an alter ego. I feel better about myself when I look my best. I always find the time to put on my powder and do my chignon. I think the beauty looks I most regret are those I was persuaded into. I'd say the only time I ever get nervous is around great ballet dancers or people I really admire. All over the land are vast and handsome pastures, with good grass for cattle, and it strikes me the soil would be very fertile were the country inhabited and improved by reasonable people. Seeing that our thirst was increasing and the water was killing us, while the storm did not abate, we agreed to trust to God, Our Lord, and rather risk the perils of the sea than wait there for certain death from thirst. The only way to sustain a career is to be as prolific as you can be, and open to opportunities. Ultimately when I throw myself behind a movie, I have to really believe in that director's vision. Being on a set where the director has lost control is just sickening. No one goes the extra mile, there's a lot of eye-rolling... it just breeds inertia. If a director is in control, the crew follow their leader. But the second anyone senses the directors are not sure, people just swoop in. In film producing, there is an inherent tension between the director, the money and the producer, and that's what keeps it flowing and honest and accountable. Theatrically seeing a movie with a group of people and having a collective experience has an authenticity that you can't get with your big screen television.